Back muscles frequently are tight and shortened from the excessive sitting we require of them (office, car, couch, etc). Having loosened back muscles can make such a difference to your posture, flexibility & pain relief. Try the following back stretches to loosen up a bit. See more below! Lie on your back and bring one knee to your chest. Allow your knee to cross your body and be draw toward the floor. This will naturally rotate the lumbar spine. You can use your hand to press down on your knee for an added stretch. Begin on hands and knees. Arch back toward ceiling. The switch to let back drop into a swayback. While standing lift one arm overhead and lean to the opposite side. Allow the weight of your arm to gently push into the stretch. Switch to other side and repeat. Stand and reach both arms overhead and interlock your fingers. Press hands toward the sky while breathing deeply. Start standing, cross an arm in front of you & holding onto a steady object. Bend forward at the waist. Curl hips under your torso. Repeat on opposite side. Lay face down with legs drawn up underneath torso. Arms can be straight overhead or dropped to the side next to your body. Breathe deeply. Lay on back with legs drawn to chest. Wrap arms around legs like a hug. Slowly rock side to side. This is an advanced position. Only try this if you have been practicing this pose. There are levels of progressions for it. First start with a hip bridge by laing on your back with knees bent. Arms are lying at your sides. Push hips up and squeeze glutes. Next progression is to do the hip bridge, place hands on floor near head and push up so that your head and hands are supporting you. Last progression is same as before and add on pushing through your arms so they are straight and head is off the floor. 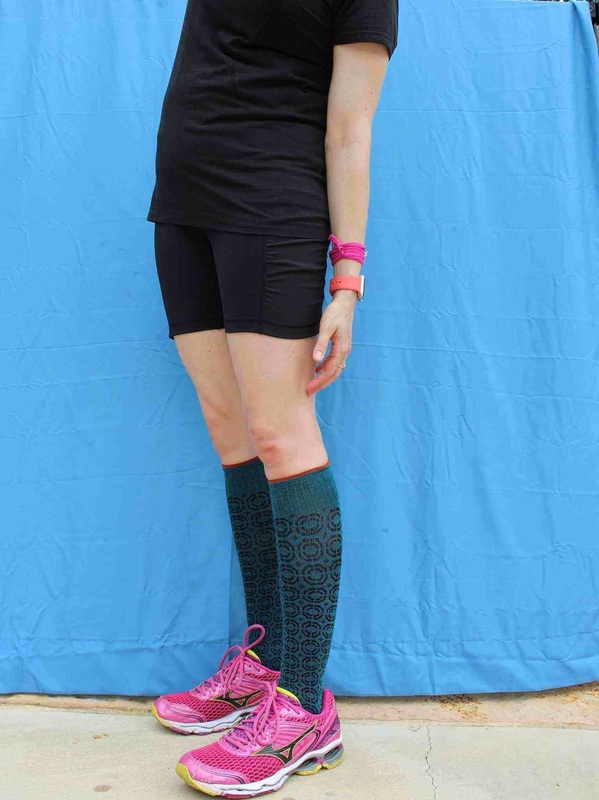 I personally purchased all of the Sockwell compression socks & was not asked to endorse or use them in my blog post. All opinions are expressed as my own.